Popular BBC broadcaster Paxman (The English, 2000, etc.) examines the monarchy’s relevance to contemporary British society. Best known for his confrontational interviews on current-affairs program Newsnight, Paxman keeps his scabrous side firmly in check, taking a relaxed, even humorous approach here. The author quickly establishes his affinity for the oft-troubled fortunes of Britain’s royals with amusing anecdotes about a visit to Sandringham (quizzed about the purpose of the monarchy, Prince Charles quipped, “we’re a soap opera”), the BBC’s archaic preparations for the Queen Mother’s death and a bizarre encounter with Princess Diana. The author casts his net wide as he sets about his task, demonstrating a vast knowledge of all things royal as he darts back and forth in time, linking various events from the past to those of the present. The bookish, chain-smoking Queen of Denmark (Victoria’s great-great-granddaughter) and the sometimes controversial Prince Philip are two of the people interviewed, and the author draws insightful and occasionally humorous jabs from both. 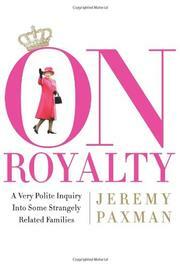 Philip rails against the tabloids and even seems agitated that his wife (whom he refers to as “the queen”) reads “every bloody paper she can lay her hands on.” Paxman keeps a generous distance from his subjects for most of the book, reserving his personal opinions for the concluding chapter, which conveys his belief that the royal family will be around for quite some time. Using the surge of interest in Diana’s funeral as a springboard, he points out the inexorable grip the monarchy maintains on our collective imaginations, notes the impracticality of any attempt to break up the royal family and adds interesting notes on their historical and mythological value.